A main distinguishing feature of a wireless network compared with a wired network is its broadcast nature, in which the signal transmitted by a node may reach several other nodes, and a node may receive signals from several other nodes, simultaneously. Rather than a blessing, this feature is treated more as an interference-inducing nuisance in most wireless networks today (e.g., IEEE 802.11). This paper shows that the concept of network coding can be applied at the physical layer to turn the broadcast property into a capacity-boosting advantage in wireless ad hoc networks. Specifically, we propose a physical-layer network coding (PNC) scheme to coordinate transmissions among nodes. In contrast to "straightforward" network coding which performs coding arithmetic on digital bit streams after they have been received, PNC makes use of the additive nature of simultaneously arriving electromagnetic (EM) waves for equivalent coding operation. And in doing so, PNC can potentially achieve 100% and 50% throughput increases compared with traditional transmission and straightforward network coding, respectively, in 1D regular linear networks with multiple random flows. The throughput improvements are even larger in 2D regular networks: 200% and 100%, respectively. One of the biggest challenges in wireless communication is how to deal with the interference at the receiver when signals from multiple sources arrive simultaneously. In the radio channel of the physical-layer of wireless networks, data are transmitted through electromagnetic (EM) waves in a broadcast manner. The interference between these EM waves causes the data to be scrambled. To overcome its negative impact, most schemes attempt to find ways to either reduce or avoid interference through receiver design or transmission scheduling . For example, in 802.11 networks, the carrier-sensing mechanism allows at most one source to transmit or receive at any time within a carrier-sensing range. This is obviously inefficient when multiple nodes have data to transmit. While interference causes throughput degradation on wireless networks in general, its negative effect for multihop ad hoc networks is particularly significant. For example, in 802.11 networks, the theoretical throughput of a multihop flow in a linear network is less than 1/4 of the single-hop case due to the "self-interference" effect, in which packets of the same flow but at different hops collide with each other [2, 3]. Instead of treating interference as a nuisance to be avoided, we can actually embrace interference to improve throughput performance with the "right mechanism". To do so in a multihop network, the following goals must be met. A relay node must be able to convert simultaneously received signals into interpretable output signals to be relayed to their final destinations. A destination must be able to extract the information addressed to it from the relayed signals. The capability of network coding to combine and extract information through simple Galois field GF( ) additions [4, 5] provides a potential approach to meet such goals. However, network coding arithmetic is generally only applied on bits that have already been correctly received. That is, when the EM waves from multiple sources overlap and mutually interfere, network coding cannot be used to resolve the data at the receiver. So, criterion 1 above cannot be met. This paper proposes the application of network coding directly within the radio channel at the physical-layer. We call this scheme Physical-layer Network Coding (PNC). The main idea of PNC is to create an apparatus similar to that of network coding, but at the physical-layer that deals with EM signal reception and modulation. Through a proper modulation-and-demodulation technique at the relay nodes, additions of EM signals can be mapped to GF( ) additions of digital bit streams, so that the interference becomes part of the arithmetic operation in network coding. The basic idea of PNC was first put forth in our conference paper in . Going beyond , this paper addresses a number of practical issues of applying PNC in wireless networks. In particular, we evaluate the performance of PNC based on specific scheduling algorithms for 1D and 2D regular networks that make use of PNC (The PNC scheduling schemes in this paper can be easily extended to more general networks as in ). Compared to the traditional transmission and the straightforward network coding, our analytical results show that PNC can improve the network throughput by a factor of 2 and 1.5, respectively, for the 1D network, and by a factor of 3 and 2 respectively for the 2D network. In 2006, we proposed PNC in  as demodulation mappings based on different modulation schemes. A similar idea was also published independently in  at the same time by another group. After that, a large body of work from other researchers on PNC began to appear. The work can be roughly divided into three categories. In the first category, PNC is regarded as a modulation-demodulation technique. Many new PNC mapping schemes have been proposed since . For example,  proposed a scheme based on Tomlinson-Harashima precoding. Following ,  proposed a simple relay strategy called analog network coding (ANC), in which the relay amplifies and forwards the received superimposed signal without any processing. Analog network coding turns out to be similar to a scheme earlier by researchers in the satellite communication society . In , a number of memoryless relay functions, including PNC mapping and the BER optimal function, were identified and analyzed assuming phase synchronization between signals of the transmitters. In , we observed that there is a one-to-one correspondence between a relay function and a specific PNC scheme under the general definition of memoryless PNC. Besides the precise definition of memoryless PNC which distinguishes it from the traditional straightforward network coding (SNC),  also gave a number of new PNC schemes. Reference  proposed a new PNC scheme where the relay maps a group constellation points to one signal according to the phase difference of the two end nodes' signals. The mechanism also takes care of the phase difference between the two end nodes implicitly. In the second category, PNC and channel coding are studied jointly. In [14–16], PNC was combined with Lattice code or LDPC code. It was proved that the capacity of the two-way relay channel can be approached in high SNR and low SNR. In [14–16], channel coding and PNC mapping are performed independently (i.e., successively). In , we proposed a novel scheme which treats channel coding and PNC in an integrated manner. We show that joint channel-PNC decoding can outperform the previous schemes significantly. In the third category, the focus is on the performance impact and significance of PNC in large-scale wireless networks. For one-dimensional wireless networks,  showed that PNC can improve the capacity by a fixed factor, although it does not change the scaling law. For two-dimensional wireless networks,  showed that PNC can increase capacity by a factor of 2.5 for the rectangular networks and a factor 2 for the hexagonal networks. However, the result in  is obtained based on a rough scheduling scheme which is established traditional network coding rather than physical-layer network coding (the special properties of PNC are ignored). Our paper here also discusses the application of PNC in large-scale wireless networks. It is different from  in that we provide the construction of an explicit PNC-scheduling algorithm (specially designed for PNC), upon which all our results are established. Compared with , we consider the many-to-many scenario with multiple sources and destinations, while  only considered the one-to-many scenario with one source. The rest of this paper is organized as follows. Section 2 overviews the basic idea of PNC with a linear 3-node multihop network. Sections 3 and 4 investigate the application of PNC in the 1D regular linear network and 2D regular grid network, respectively. Section A concludes the paper. Consider the three-node linear network in Figure 1. (Node 1) and (Node 3) are nodes that exchange information, but they are out of each other's transmission range. (Node 2) is the relay node between them. This three-node wireless network is a basic unit for cooperative transmission and it has previously been investigated extensively [20–25]. In cooperative transmission, the relay node can choose different transmission strategies, such as Amplify-and-Forward or Decode-and-Forward , according to different Signal-to-Noise (SNR) situations. This paper focuses on the Decode-and-Forward strategy. We consider frame-based communication in which a time slot is defined as the time required for the transmission of one fixed-size frame. Each node is equipped with an omnidirectional antenna, and the channel is half duplex so that transmission and reception at a particular node must occur in different time slots. Slow fading is assumed throughout this paper for the ease of synchronization. Before introducing the PNC transmission scheme, we first describe the traditional transmission scheduling scheme and the "straightforward" network-coding scheme for mutual exchange of a frame in the three-node network [20, 25]. In traditional networks, interference is usually avoided by prohibiting the overlapping of signals from and to in the same time slot. A possible transmission schedule is given in Figure 2. Let denote the frame initiated by . first sends to , and then relays to . After that, sends in the reverse direction. A total of four time slots are needed for the exchange of two frames in opposite directions. Similarly, can extract . A total of three time slots are needed, for a throughput improvement of 33% over the traditional transmission scheduling scheme. where , = 1 or 3, is the bandpass signal transmitted by , is the bandpass signal received by during one symbol period, is the BPSK modulated information bit of , and is the carrier frequency. Then, will obtain a baseband signal . Note that cannot extract the individual information transmitted by and , that is, and , from the combined signal in . However, is just a relay node. As long as can transmit the necessary information to and for extraction of and over there, the end-to-end delivery of information will be successful. For this, all we need is a special modulation/demodulation mapping scheme, referred to as PNC mapping in this paper, to obtain the equivalence of GF(2) summation of bits from and at the physical-layer. Table 1 illustrates the idea of PNC mapping. In Table 1, is a variable representing the data bit of and is a variable representing the BPSK modulated bit of such that . PNC Mapping: modulation mapping at , ; demodulation and modulation mappings at . The BER analysis in  shows that the end-to-end BER for the three schemes is similar when the per-hop BER is low (the BER is less than for 10 dB). Ignoring the slight BER difference, we have the following conclusion. For a frame exchange, PNC requires two time slots, 802.11 requires four, while straightforward network coding requires three. Therefore, PNC can improve the system throughput of the three-node wireless network by a factor of 100% and 50% relative to traditional transmission scheduling and straightforward network coding, respectively. Our discussions so far has only focused on the simple 3-node network with one bidirectional flow. In this section, we discuss the application of PNC in 1D regular networks. There are two reasons for this discussion. First, the schemes proposed in regular network still work in random networks. And the analytical results in regular networks also provide some insights about applying PNC in random networks. Second, the regular network can also find applications in real world. For example, APs (access points) positioned along a highway form a regular linear chain in a vehicular network. Consider a regular linear network with nodes with equal spacing between adjacent nodes. Label the nodes as node 1, node 2, , node , successively with nodes 1 and being the two source and destination nodes, respectively. Figure 5 shows a network with = 5. Suppose that node 1 is to transmit frames , , . to node , and node is to transmit frames , , . to node 1. Bidirection PNC transmission in linear network. We could divide the time slots into two types: odd slots and even slots. In the odd time slots, the odd-numbered nodes transmit and the even-numbered nodes receive. In the even time slots, the even-numbered nodes transmit and the odd-numbered nodes receive. Figure 5 shows the sequence of frames being transmitted by the nodes in a 5-node network. In slot 1, node 1 transmits to node 2 and node 5 transmits to node 4 at the same time. In slot 2, node 2 and node 4 transmit and to node 3 simultaneously; both node 2 and node 4 also store a copy of and in their buffer, respectively. In slot 3, node 1 transmits to node 2, node 5 transmits to node 4, and node 3 broadcasts simultaneously; node 3 stores a copy of in its buffer. Adding the stored to received with PNC detection, node 2 can obtain . Node 4 can obtain similarly. In slot 4, node 2 and node 4 broadcast and , respectively. In this way, node 5 receives a copy of and node 1 receives in slot 4. Also, in slot 4, node 3 obtains by adding stored packet to the received packet . With reference to Figure 5, we see that a relay node forwards two frames, one in each direction, every two time slots. So, the throughput is 0.5 frame/time slot in each direction. Due to the half duplex assumption, this is the maximum possible throughput we can achieve. As detailed above, when applying PNC on the linear network, each node transmits and receives alternately in successive time slots; and when a node transmits, its adjacent nodes receive, and vice versa (see Figure 5). Let us investigate the signal-to-inference ratio (SIR) given this transmission pattern to make sure that it is not excessive. Consider the worst-case scenario of an infinite chain. We note the following characteristics of PNC from a receiving node's point of view. The interfering nodes are symmetric on both sides. The simultaneous signals received from the two adjacent nodes do not interfere due to the nature of PNC. The nodes that are two hops away are also receiving at the same time, and therefore will not interfere with the node. where is the common (In a regular network, a trivial result of power control is that every node uses the same transmission power if the distances between adjacent nodes are constant) transmitting power of the nodes and is the path-loss exponent. According to , for free space, = 2.7 3.5 for urban cellular networks, and = 4 6 for in-building transmission. We calculate the SIR for different and the results are shown in Table 2. As can be seen, when (this is typical in wireless networks), the SIR is no less than 10 dB and the impact of the interference on BER is negligible for BPSK based on  (the capture threshold is often set to 10 db in wireless networks ). More generally, a thorough treatment should take into account the actual modulation scheme used, the difference between the effects of interference and noise, and whether or not channel coding is used. However, we can conclude that as far as the SIR is concerned, PNC is not worse than traditional scheduling (see Section 4) when generalized to the n-node linear network (In this paper, we assume that channel coding  is properly used at all the nodes and the packets can be correctly decoded to avoid error propagation once the targeted SIR is achieved. Reference  provides and investigates a hop-to-hop channel coding scheme for PNC). Part A considers only one bidirectional flow. Here we consider a general setting in which there are unidirectional flows in the -node linear network. Note that this generalization includes the scenario in which there is a combination of unidirectional and bidirectional flows in the network, since each bidirectional flow can be considered as two unidirectional flows. To allow PNC to be applied, we compose bidirectional flows out of the unidirectional flows by matching pairs of unidirectional flows in opposite directions. The bidirectional flows can then make use of PNC for transmission, while the remaining unmatched unidirectional flows make use of the traditional strategy of multihop data transmission. The optimal way to compose the bidirectional flows and schedule the transmission of the links in the flows is a tough problem. Here we consider a simple heuristic which is asymptotically optimal for the regular -node linear network when goes to infinity as shown in Part C. For simplicity, we assume that all flows have equal traffic. We define the following terms with respect to the linear network. Let us label the nodes from left to right by 1 to sequentially. Let denote the source-destination pair of flow . For a right-bound flow, ; for a left-bound flow, . Let denote the overall set of flows, and be the set of right-bound flows and be the set of left-found flows. Two right-bound (left-bound) flows and are said to be nonoverlapping if or ( or ). A right packing (left packing) is a set of nonoverlapping right-bound flows (left-bound flows). A dual packing consists of a right packing and a left packing. Figure 6 shows an example of a dual packing. Flows 2 and 3 form a right packing, and Flow 1 forms a left packing. Note that some of the nodes are traversed by both a right-bound flow and a left-bound flow. Let us call these nodes the common nodes, and the other nodes the noncommon nodes. A sequence of adjacent common nodes, flanked by but not including two noncommon nodes at two ends (an ellipse in Figure 6), forms a PNC unit, and we can use the PNC mechanism for transporting the bidirectional traffic over it. A sequence of adjacent noncommon nodes, together with the two common nodes flanking them (a rectangle in Figure 6), may or may not have traffic flowing over them. When there is traffic, the traffic is in one direction only, and the traditional multihop communication technique can be used to carry the unidirectional traffic. Essentially, by forming a dual packing, we also form many "virtual" bidirectional flows (each corresponding to a PNC unit) on which PNC can be applied. An example of a dual packing formed by a right packing and a left packing. An ellipse corresponds to a PNC unit. The nodes between two adjacent ellipses (including the terminal nodes of the ellipses) are grouped together by a rectangle. Our heuristic as showing in Algorithm 1 consists of a method of forming dual packings from the unidirectional flows. The dual packings yield a set of "virtual" bidirectional flows, each corresponding to a PNC unit. Scheduling can then be performed as follows. Let us refer to the time needed for all the unidirectional flows to transfer one packet from source to destination as one frame. Each link (hop) of a flow is allocated one time slot for transmission within a frame. A frame is further divided into two intervals, as follows. The first interval is dedicated to the PNC units (i.e., ellipses). Note that if there are M dual packings, time slots are needed in the worst case; in the worst case, different dual packings use different time slots to transmit, and 2 time slots are needed for each dual packing (Two caveats are in order. The first is that according to our construction, there could be "trivial" PNC units with two nodes only. In this case, the PNC mechanism is not needed, and each node gets to transmit directly to the other node. Regardless of whether the PNC unit is trivial or not, two time slots are needed for the bidirectional flows. The second caveat is that there could be two PNC units in the same dual packing next to each other. For example, suppose nodes 1, 2, and 3 form a PNC unit, and nodes 4, 5, 6 form another. To avoid conflict, the scheduling of the transmissions on these two PNC units should be such that nodes 1, 3, 4, and 6 transmit in one time slot while nodes 2 and 5 transmit in another time slot. Again, two time slots are needed.). The second interval is dedicated to the nonPNC units (i.e., rectangles). The nodes of all rectangles of all dual packings are scheduled to transmit using the conventional scheme. The number of time slots needed in the second interval depends on both the number and the lengths of the rectangles. As will be shown in Part C, it can be ignored compared to the time slots needed in the first interval as goes to infinity. We now show that the packing and scheduling strategies presented in Part B can allow the upper-bound capacity of 1D network to be approached when the number of nodes goes to infinity. Furthermore, compared with the conventional schemes discussed in , PNC can achieve a constant factor of throughput improvement. We first detail the system model. To avoid edge effects, we consider a "large" circle instead of a line. The nodes are uniformly distributed over the circle with a constant distance between adjacent nodes. Without loss of generality, let the distance between two adjacent nodes be a unit distance. Each transmission is over only one unit distance (i.e., a node only transmits to its two adjacent nodes). Consider the receiver of a link. We assume that simultaneous transmission by another link whose transmitter is two or more hops away from the receiver of the first link will not cause a collision to the first link. In our model, nodes are randomly chosen as the source nodes. The remaining nodes are the potential destination nodes. For each source node, a unique destination node is chosen among the potential destination nodes with equal probability. We assume matching without replacement in that the destination node chosen for a source node will not be put back to the pool before the destination node of another source is chosen. The route for a source-destination pair is also predetermined in a random way (note: there are two routes from a source to its destination, one in the clockwise direction and the other in the counterclockwise direction). where unit link bandwidth is assumed. Let us now focus on the PNC throughput. We will show that PNC can achieve the per-flow throughput for any small positive value as goes to infinity. Let us first provide further details to the scheduling strategy presented in Part B. The packing and scheduling are as follows. For packing, we first unwrap the circle to a noncircular linear network by randomly selecting the source node of a clockwise flow, labelled , on the circle as the start point of the linear network. The adjacent node of the selected source node in the counterclockwise direction in the circle, labeled , will serve as the end point of the linear network. Next, we obtain one packing of the clockwise flows according to the packing algorithm in Part B. It is possible that the last selected flow crosses the start point. In that case, we cut the flow into two subflows by performing the cut between the start point and the end point, and only consider the first subflow in the aforementioned packing. After forming the above clockwise unidirectional packing, we form a matching counterclockwise unidirectional packing at choosing as the start point and as the end point. If there is an existing counterclockwise flow with as its source node, we will start with this flow in the unidirectional packing. If not, we will choose the next flow with source node closest to e in the counterclockwise direction in our packing. For "traffic balance", after getting the first dual packing as above, for the next dual packing, we will start with forming the counterclockwise unidirectional packing first (i.e., and will be defined with respect to the counterclockwise packing) before constructing the matching clockwise packing. Repeating the above procedure allows us to form a series of dual packings. The scheduling of transmissions is the same as that in Part B except that here we also have to consider the transmission across the two subflows cut as above, if any. We assume the traffic from the destination of a preceding subflow to the source of its corresponding subflow is transmitted using the conventional scheme in the second interval. With the above packing and scheduling strategies, we have the following theorem on the per-flow throughput of the 1D circular network when goes to infinity. A sketch of the proof for Theorem 1 is provided here and a detailed proof is given in the Appendix. With the help of the max-flow min-cut theorem, the upper bound of the per-flow throughput for our 1D circular network can be shown to be . That this upper bound can be approached with the application of the aforementioned PNC packing and scheduling strategies is argued as follows. Consider the original N/4 unidirectional flows. With PNC packing and scheduling, these flows have been decomposed into PNC units and nonPNC units for transmission in the first and second intervals. For each round of first and second intervals (i.e., for each frame), one packet is transported from the source to the destination of each flow. We can show that the number of time slots needed in the first interval for all the flows is at most , where the small positive quantity goes to zero as goes to infinity. 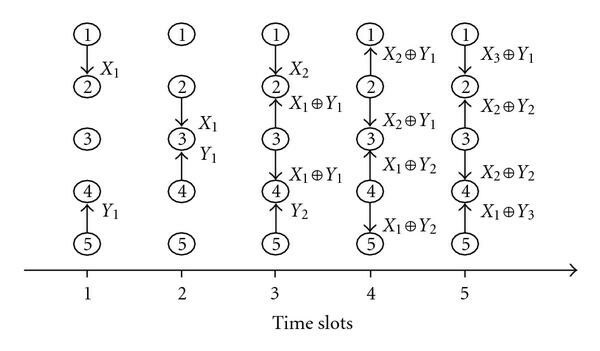 The number of time slots needed in the second interval, on the other hand, is , where the small positive quantity goes to zero as goes to infinity. Then we can obtain the per-flow throughput with PNC: . A corollary of Theorem 1 is that PNC can improve the throughput of the 1D network by a factor of 2 and 1.5 relative to the traditional transmission scheme and the SNC scheme (7), respectively. A notable fact is that PNC can approach the capacity with minimum energy. Recall that PNC exchanges one packet between the two end nodes within two time slots, during which each of the n nodes on the chain transmits once with energy E t and receives once with energy . And a total energy is used. In fact, is the lower bound of energy to exchange one packet. For one exchange, the two end nodes must transmit once to send their message and must receive once to obtain their needed message; the relay nodes must receive once and transmit once to finish one relay. Therefore, the energy of is necessary. Section 3 focused on the 1D regular network. This section investigates the application of PNC in a 2D regular gird network. We assume the same transmission protocol as in Section 3. Figure 7 shows the grid network under consideration, in which nodes are uniformly located at the cross points as shown. In this part, we first consider the case in which each line (horizontal or vertical) on the grid has one and only one bidirectional flow. Specifically, the two end nodes in each line, node 1 and node , exchange information through the relay nodes in between. The flows transmit with the following PNC schedule. Consider the horizontal lines (similar schedule applies for the vertical lines). The first two time slots are dedicated to transmissions on lines ; the next two time slots are dedicated to transmissions on lines nodes on the lines ; and so on. The separation J must be large enough for acceptable SIR. In the example of Figure 7, . For a group of simultaneous active lines, to reduce SIR, when the odd nodes transmit on one active line, then the even nodes will transmit on its two adjacent active lines, as shown in Figure 7. For a typical value of , the SIR in (9) is about 13.5 dB, 12.3 dB, and 10.0 dB for equals 5, 4, and 3, respectively. With an assumed 10 dB target, is enough to guarantee successful transmission. Let us now investigate the application of PNC in the 2D grid network with a more general traffic pattern. With respect to Figure 7, we now randomly choose of the nodes as the source nodes. The remaining nodes are the destination nodes. Here we apply a simple routing scheme, as in . For a source-destination pair at positions and , the data will first be forwarded vertically to the node at before being forwarded horizontally to the destination. The horizontal and vertical transmissions are separated into two different time intervals. For horizontal (or vertical) transmissions, the scheduling within each line (column) is the same as that in the Section 3.2 and the scheduling among different lines (columns) is the same as in part A. In the 2D grid network, the nodes are tightly packed than in the 1D network, and the interfering nodes must be kept at least 3 hops away, that is, , to obtain an SIR of no less than 10 dB (note: in the 1D network, could be 1 for SIR of about 10 dB). When , we can verify that throughputs better than (11) cannot be achieved. In other words, the throughput in (11) is also the upper bound for traditional transmission scheme and SNC scheme under all possible schedulings. Therefore, setting in (10), we conclude that PNC can achieve a throughput improvement factor of 3 and 2 relative to the traditional transmission scheme and the SNC scheme, respectively. Note that the improvement factors under the 2D network are larger than those under the 1D network, which are 2 and 1.5, respectively (see Section 3). This paper has introduced a novel scheme called Physical-layer Network Coding (PNC) that significantly enhances the throughput performance of multihop wireless networks. Instead of avoiding interference caused by simultaneous electromagnetic waves transmitted from multiple sources, PNC embraces interference to effect network-coding operation directly from physical-layer signal modulation and demodulation. With PNC, signal scrambling due to interference, which causes packet collisions in the MAC layer protocol of traditional wireless networks (e.g., IEEE 802.11), can be eliminated. We have proposed explicit scheduling algorithms for PNC in 1D and 2D regular networks with multiple random flows. It is shown that PNC can potentially achieve 100% and 50% throughput increases compared with traditional transmission and straightforward network coding, respectively, in the 1D regular linear network. The throughput improvements are even larger in the 2D regular network: 200% and 100%, respectively. In particular, PNC can allow the upper-bound throughput of the 1D regular network to be approached as the number of nodes goes to infinity. This work was partially supported by the Competitive Earmarked Research Grant (project number 414507) established under the University Grant Committee of the Hong Kong and the Natural Science Foundation of China (project number 60902016). This appendix proves Theorem 1 in three steps. First, the fact that is the upper bound for the throughput of the 1D circular linear network can be argued as follows. Let us consider the number of time slots needed so that each flow can transport one packet from its source to its destination. Due to half-duplexity, there can be at most transmitting nodes in a time slot. In general, each transmitting node can transmit to at most two of its adjacent nodes simultaneously. Hence, in total, there can be at most one-hop transmissions being successfully completed in each time slot. The number of hops between the source and destination of a flow is on average . There are altogether flows. Using Chernoff bound, we can show that the total number of one-hop transmissions required (aggregated over all flows) is w.h.p. as goes to infinity. Thus, the time slots needed are lower bounded by . Within this number of time slots, each flow transports a packet from source to destination. Thus, the per-flow throughput is upper bounded by . Next, we prove that the number of time slots needed in the second interval is negligible compared to , denoted by where is a small positive quantity that goes to zero as goes to infinity. The total one-hop transmissions in the second interval can be divided into two parts, the one-hop transmissions in the rectangles and the one-hop transmissions between subflows (created when we unwrap the circular network into a linear network). Let us first consider the rectangles. As shown in Figure 8, within a dual packing, the rectangles do not overlap. Furthermore, the two end nodes in a rectangle must be either a source or destination node of some flow. As a proof technique, let us artificially divide the rectangles into two groups according to the dual packings containing them. Recall that the dual packings are formed successively in our packing algorithm. Consider the first fraction of all flows (including the original flows and the generated subflows) that are included successively into the dual packings. The first group of rectangles arises from these flows. The second group of rectangles belongs to the remaining fraction of the flows. We set such that . An example of a dual packing, where flow 1 and flow 2 belong to the clockwise unidirectional packing, flow 3 and flow 4 belong to the counterclockwise unidirectional packing. The white nodes are nonresidual nodes, the red nodes are the residual nodes of the clockwise unidirectional packing, the green nodes are the residual nodes of the counterclockwise packing, and the blue nodes are the residual nodes of both the two unidirectional packings. The nodes in the rectangles are the uncommon nodes. As discussed in Section 3.2, when we perform packing on the circular network by unwrapping it to a linear network, it is possible for a flow to be cut into two subflows. Each clockwise unidirectional packing contains at least one flow that does not generate subflows (a flow cannot have more than N hops). As a corollary, if the clockwise packing contains a flow that has been cut into two subflows, then the packing must contain at least two flows to start with. One of these subflows will be relegated to a future packing exercise. So, each clockwise packing reduces the number of remaining flows to be packed by at least one. For the matching counterclockwise packing, at most one flow will be cut into two subflows. Thus, the matching counterclockwise packing does not increase the number of remaining counter-clockwise flow. Recall from the discussion in Section 3.2 that for "traffic balance" successive dual packings will start with clockwise and counterclockwise packings in an alternate manner. Thus, successive dual packings will reduce the numbers of remaining clockwise and counterclockwise flows by at least one alternately. In the beginning, there are original flows ( of which are clockwise and of which are counterclockwise flows). From the argument in the previous paragraph, there are altogether at most dual packings. Each dual packing will at most generate at most two extra flows to the flow pool (because of cut between and ). Thus, altogether there could be at most extra flows being generated. Hence, the total number of flows (including the original flows and the subflows) is . Now, consider the transmissions across subflows. A one-hop transmission is needed for two adjacent subflows generated by the cut when we unwrap the circular network to a corresponding linear network. In other words, there is a one-hop transmission whenever there is an extra subflow, which is upper bounded by according to the above argument. Thus, the total number of one-hop transmissions between all adjacent subflows is upper bounded by . where is determined by , , and . It is easy to show that will go to zero as goes to infinity. Finally, we prove that the number of time slots needed in the first interval is less than . In a unidirectional packing, a residual node is an idle node that through which no packet passes (i.e., none of the flows of the unidirectional packing passes through the node). Thus, the number of nodes through which one packet passes in one unidirectional packing is , minus the number of residual nodes. Consider a dual packing to which group-1 rectangles belong. According to Lemma 1 immediately after the proof of Theorem 1 here, the number of residual nodes in each of the unidirectional packings of the dual packings is less than log( ) w.h.p.. That is, the number of nonresidual nodes in a unidirectional packing is more than -log( ) w.h.p., and the number of nonresidual nodes in both the unidirectional packings of the dual packing is more than . That is, the traffic handled by each dual packing (in terms of packet flows across all nodes in the dual packing) is more than . Now, consider an arbitrary node in the network. According to our model, it is either the source or destination of some flow. The packet of that flow passes through it with probability 1. For the other original flows, a packet passes through the node with probability 1/2. By the Chernoff-Hoeffding theorem, the number of packets that go through each node is w.h.p.. Considering all nodes, the number of packets passing through them is . Note that this is the total traffic which is more than the traffic in the dual packings to which group-1 rectangles belong. with high probability, where is determined by and . It is easy to verify that goes to zero as goes to infinity. Since each packing needs at most two times slots, the time slots needed for the first interval are at most . where can be obtained from , , and , and it goes to zero as goes to infinity. Then Theorem 1 is proved. For any clockwise (counterclockwise) unidirectional packing contained in the dual packings to which group-1 rectangles belong, the number of residual nodes is less than w.h.p. Let denote the set of dual packings to which group-1 rectangles belong. Let us focus on one clockwise unidirectional packing in . The proof for the counterclockwise case is similar. Let be the clockwise packings in . Let m denote the number of clockwise flows in . According to our way of partitioning the rectangles into the two groups, we have , where is the total number of clockwise flows. Recall that in our traffic model, we randomly select nodes to be sources and nodes to be destinations. In other words, any node among the nodes is either a source or a destination. This applies to any residual node in as well. In particular, a residual node in is either ( ) a destination node (of a clockwise or counter-clockwise flow), ( ) a source node of a counter-clockwise flow, or ( ) a source node of a clockwise flow. In case 3, since the residual node is a residual node in , it must be a source node of a clockwise flow already packed (i.e., already belong to ) prior to packing . When , as -goes to infinity, the above probability is , which will approach zero. Thus, Lemma 1 is proved. For group-1 rectangles, the number of nodes in each rectangle is no more than 2 with probability , where is a small positive quantity that goes to zero when N goes to infinity. With respect to Figure 8 and the explanation in its caption, let denote the number of red, green, and blue nodes in a dual packing, respectively. By Lemma 1, , and w.h.p. Thus, .